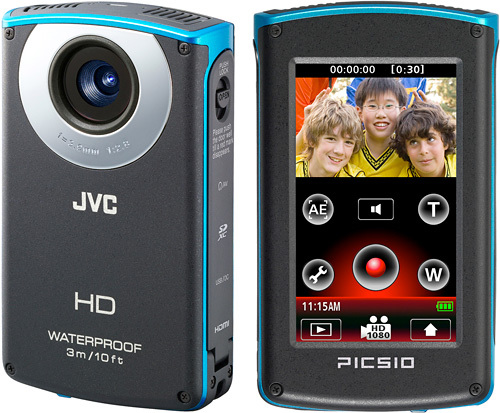 JVC's New Picsio GC-WP10 Waterproof Camcorder | OhGizmo! Thanko’s 1080P HDDV-506 Camcorder With A Swiveling Lens! At one time it was really easy to choose a flash-based zoomless camcorder. You just walked into your local electronics store and bought a Flip because there really were no other options. But these days it’s not as easy, which is a good thing since competition has brought more options that are far more capable than the Flip, if that’s what you’re looking for. (The Flip’s simplicity is definitely not a bad thing.) Like this latest addition to JVC’s PICSIO line, the GC-WP10, which can capture 1080P footage on dry land or up to 10 feet underwater. At 1080P you’re limited to 30fps since these consumer friendly cameras tend to shy away from 24P, but if you reduce your resolution to 720P you can capture up to 60fps. And if you want to be really creative there are even time-lapse recording options available. ‘Round back you’ll find a glove-friendly 3-inch touchscreen LCD display with on-screen controls for recording and playback, and the GC-WP10’s got an SD/SDHC/SDXC card slot that’s Eye-Fi friendly for uploading footage over a wireless network. There’s also the requisite built-in USB connector which has become the trademark feature for these types of cameras, and last but certainly not least is its ability to record high-quality MP3s thanks to a set of stereo microphones on top. Available “late September” for $199.95. ← Thanko’s 1080P HDDV-506 Camcorder With A Swiveling Lens! I can finally take pictures of my kids after their soccer games.